Many of the photos I take on my cellphone never find their way here on my Blog. Once I share them on Instagram, Facebook and Twitter I tend to forget about them. I've seen other Bloggers write an Instagram review so I thought I would start doing the same. I think it makes a great Sunday post and I look forward to sharing these non-formal moments with you on a weekly basis! Yoga - How I love Yoga! I've been practicing for 10+yrs now, I believe I started in my 30's when I began my Spiritual journey into Oneness. It's so calming for the mind, body and spirit, it has become a part of my daily exercise regimen. Nails - The polish I choose this week was by Color Club called Kismet. It's a very pretty green hologram nail polish with duochrome shades of yellow, purple and blue. Carrot & Beet Juice - Thursday and Friday are my regular juicing days where I consume nothing but juice. This mixture consist of carrots, beets and some pineapples to sweeten. You can find more photos and the recipe Here. Power Walking - I'm wearing my Dr. Doolittle glasses and a sunvisor. I'm actually sitting down checking my emails when I snapped that photo. I live about 2 miles away from a shopping mall and I walked there and bought a few things from JCP. Custom Lace Front Wig - I've been working on this lace front wig for quite sometime now, i'm finally finished with the ventilating and i'm beginning to add baby hair to the front hairline. 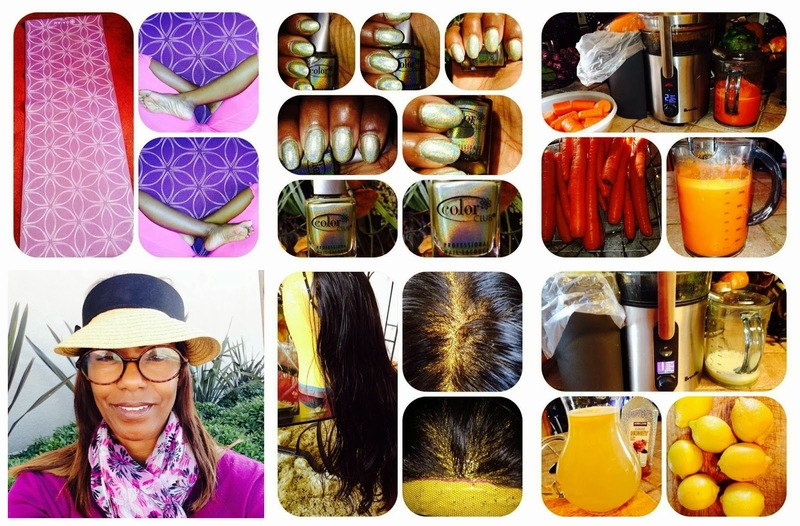 You can find out more about my Wigmaking services Here. Fresh Lemonade - During my two day juice fast, I drink fresh lemonade with a pinch of cayenne pepper every morning. This kick starts my system and promotes great bowel health.